We have enjoyed the last of the Easter food. This gluten-free angel food ice cream cake turned out wonderful. 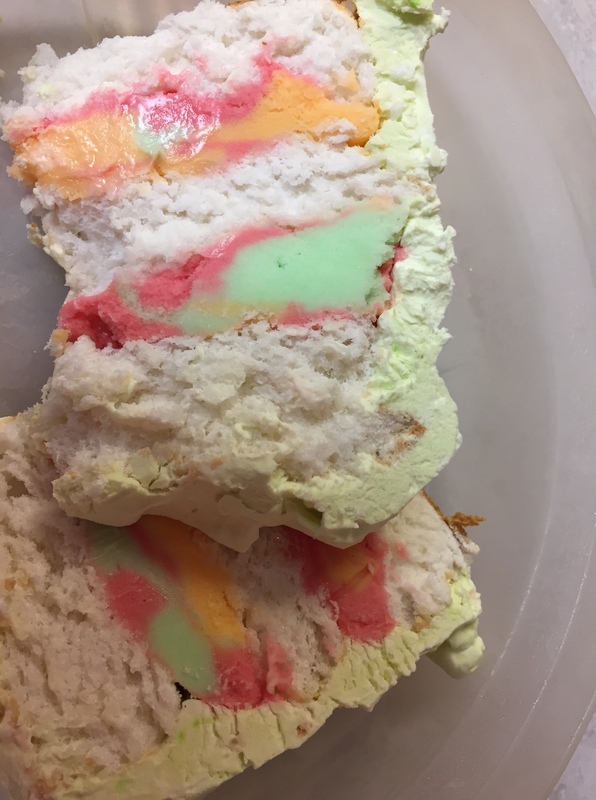 I just made the cake from a recipe from Taste of Home, added softened rainbow sherbet, froze, then pale green whipped cream that was lightly sweetened. After Easter dinner, I sliced it all and froze the slices. They have been great all week! I also had some cupcakes my daughter made, that I also froze, and am loving one once in a while. They were chocolate with caramel frosting. They were gluten-free, dairy free, egg free, soy free, and… tasted amazing! We also ate ham, lots of potatoes, etc. from the large meal. It made cooking and meal planning easy this week. I stocked back up on produce, dairy, etc. I had let the fridge empty out in anticipation of the big day. I went to Grocery Outlet for some of the groceries and got turkey lunchmeat for $1.50/lb, one box of Danimal smoothie drinks for 99c, Pretzel bites for 99c, and some other stuff. Their produce didn’t look good that day, although it is good lots of times, so I went to another store for produce. I’ve got to say, the produce was costly, but………..I’ve got to have salads, etc. I did get a free grocery tote bag from there since it was Earth Day yesterday, when I shopped there. My aunt hired the girls to do some yard work. 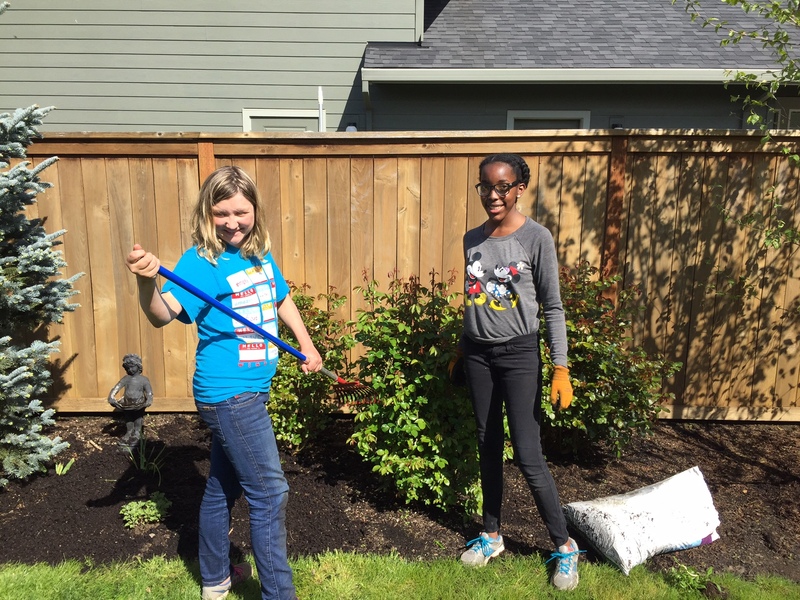 They are saving for a big homeschool trip next year, and it’s never too early to get started. Of course, she spoiled them rotten with drinks, snacks, and plenty of pay……What can I say? The yard looked great when they were done. Ja’Ana continues to clean house for a lady to earn money for her summer church activities. She is starting to rack up a good amount in her account there. She needs several hundred dollars if she wants to do it all. I’m so grateful that they make this opportunity available to the kids. Camp, for instance, is almost $300. She should have a ball, and even more so because she put in so many Saturdays to help get herself there. Lovana’s job will be ending in a few weeks. The lady she helps with is failing, and will be needing a different situation. So, her grown children are taking her back to the country where she was born, where they feel she will be most comfortable. I think that is touching. Lovana has saved money, and will be looking for another summer job. This job has become pretty difficult with the lady needing constant attention even every few hours all day and all night long, and I’m proud of her for sticking it out. A few things have sprouted in my garden. I’m watching them with anticipation. We have eaten more Swiss Chard, spinach and green onions, the only 3 things we have that overwintered. I’m shocked that the family is eating the chard. This variety is so much more mild. It’s pale green. Last time, they revolted and would not eat it at all–it was the red, orange and yellow kind. I did a little more yard work on the one nice day when I had a little time. I exercised down at the YMCA 3 times this past week. It’s so good that I’m using that membership. The cake looks amazing, and festive. Those are some special young women and I always enjoy hearing what they are up to. It’s so nice to see enterprising young ladies learning where a dollar comes from, Becky. I’m sure they all appreciate the trip more because they have contributed towards it. That cake looks delicious. Very Easter-like. Thanks. I will make that cake again. I was thinking other kinds of ice cream might make it festive for other occasions, too. Love the cake, it looks delicious. I was able to plant a small herb garden this weekend and 2 tomato plants. I tend to neglect my garden so I’m hoping to start over small and hopefully have some success. I have started rereading the Tightwad Gazette books, always full of wonderful information. Your daughters and niece are sure to have a fun time at camp after all the money they earned. Hope you have a wonderful week. I love the Tightwad Gazette book. I have a 3-in-1 volume. I love gardening. This is a whole new garden for me, and is much smaller than my old one. I’m hoping that it is more manageable than my old one–that one always got away from me by the end of the summer, but I sure got a lot of produce from it! I hope you enjoy yours. That cake is amazing! Oh I want some now. 😉 Your girls are so sweet and work so hard for what they want. Good job Mom and Dad for instilling those values in them. It will take them far in life. I too love the TightwadGazette. I started reading her when she still had her newsletter. Ok, so that’s dating me. hahaha! It came at a time in my life when I was laid off work a month after we had just bought our house. Yikes. I jumped into full time homemaking duties and we survived. Had great news this weekend. Our apartment complex is starting some veggie garden space for us tenants. I’m paired with two ladies who have young families. The three of us have been assigned one area to be responsible for and to design “our” garden space. It will be an interesting project. The very good news is that the area gets almost full sun almost all day long. It’s also just steps away from my front door. That cake takes me right back to my childhood and birthday! We found a $1000 coffee maker at a thrift store for $20. We will have to send it in to the manufacturer to be refurbished and that will be birthday, Mother’s and Father’s day gifts between us. Our son has one of these coffee makers and every time we visit and come home we pine for that coffee. No more! That’s an amazing find. I would not know a $1,000 coffee maker if I saw one, so it’s great you recognized it as such! The cake was really good. So I am typing as fast as my fingers can go! Go Jeannie! That’s a lot of typing, but I’ll look forward to reading!